United States Secretary of State Hillary Clinton arrived in Indonesia last Wednesday. She affirmed “Indonesia’s role in handling global problems, including terrorism, protectionism, climate change and the economic crisis.” Indonesia is the largest Muslim nation in the world and the third largest democracy. Aside from meeting the leaders of Indonesia, Clinton found the time to visit a slum community in Jakarta. She also appeared in a teen-oriented TV show. 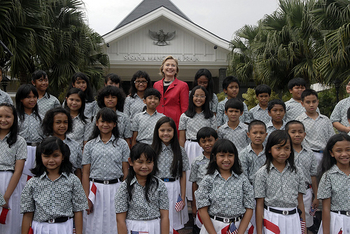 Secretary of State Hillary Clinton's visit to Indonesia starts a new era in American foreign policy. A lot less unilateral arrogance, a lot more inclusiveness and so-called smart power. Around 2 PM today, it turned out to be US Secretary of States Hillary Clinton's arrival in Jakarta that stopped the traffic! Lucky for me, there's still battery power remained on my digital camera to take a few snapshots. I saw the speech Hillary made on television and I don't know whether it's just me but that woman doesn't look exactly like Hillary. I'm starting to think the US government sent a fake one to us, because that woman looks too old and motherly to be Hillary! 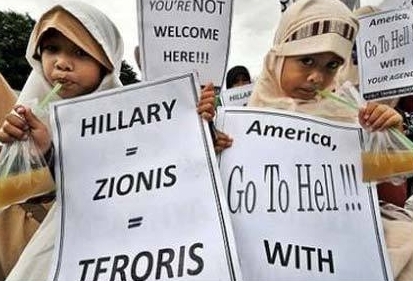 “(Clinton) should be careful not to say that Muslims in Indonesia are “moderate,” as most diplomatic visitors like to say. For members of persecuted religious groups in Indonesia, it is a useless and inaccurate cliche. waxinglyrical: someone asked who is Hillary Clinton? ?